An intercooler is a heat exchanger. That means there are two or more fluids or gas’s that don't physically touch each other but a transfer heat or energy takes place between them. Air flows in through the air intake/filter and then through tubes inside the intercooler. The air transfers heat to the tubes, warming the tubes and cooling the air. Outside air (or water) passes over the tubes and between fins that are attached to the tubes. Heat is transferred from the hot tubes and fins to the cool outside air. This heats the outside air while cooling the tubes. 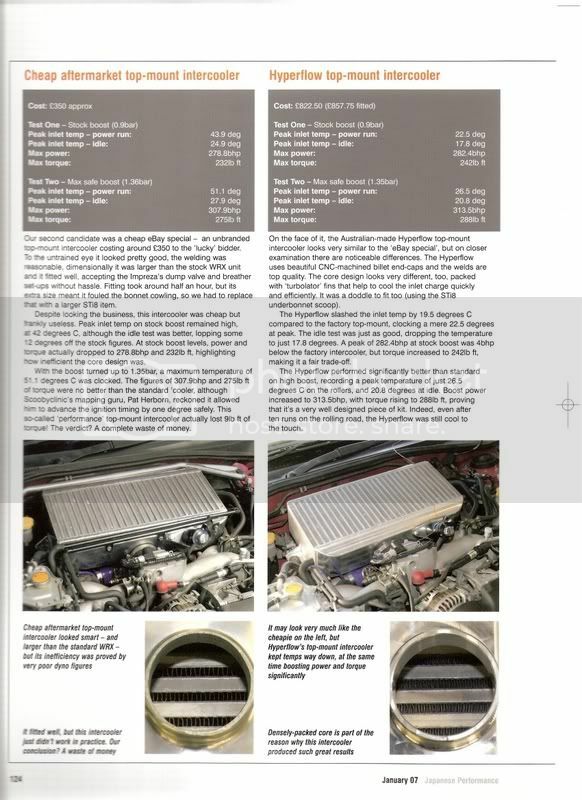 There are two main locations an intercooler is normally fixed, on the top of an engine, aka top mount, or in the lower front bumper, aka front mount. The top mount allows short lengths of pipe work to be used between the cooler and the manifold preventing heat from transferring back to the air, this also however has disadvantages. Being sat right on top of the engine means that it’s in probably the hottest part of the car and this reduces efficiency. 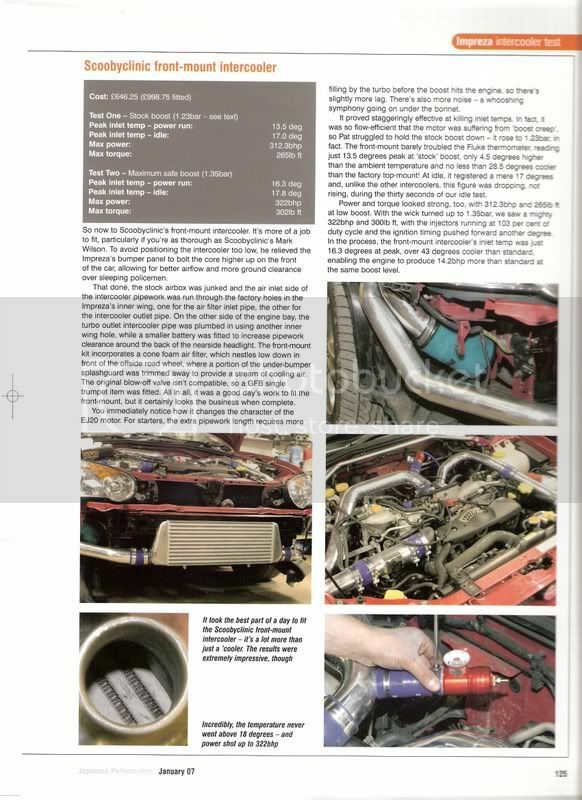 To move the intercooler away from the heat of the engine bay it is often moved to the lower front bumper, directly in the airflow as the car moves. 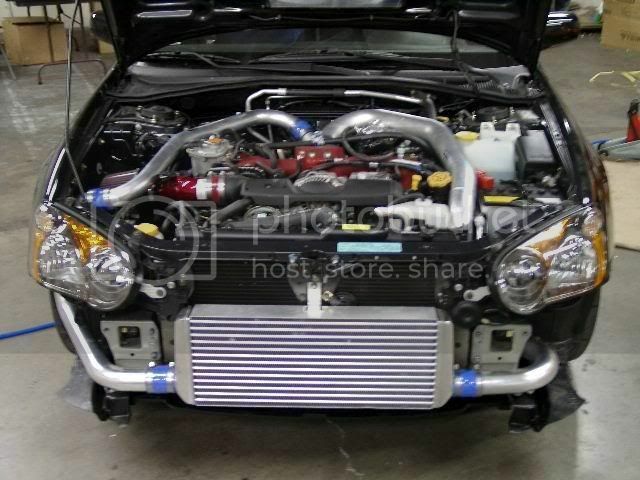 Although a front mounted intercooler will be much more effective than a top mount, it does have disadvantages. The main one is increasing turbo lag (the time it takes the turbo to gain pressure). Due to the larger volume of the front mount it takes longer for the air to fill and then start to flow through. This sudden drop in airflow also affects sensor reading such as air/fuel mixture, which will spike rich, and also exhaust temps will be affected. The problems can be corrected by adjusting the map (see ecu section) to take these factors into account. Impreza’s have as standard top mount intercoolers, fitting a front mount will cost approx £800, not including remap or map adjustment. The front mount will also require the removal of the air box for the pipe work so induction kit is required.. Induction kit required is oil free as to not coat the maf. The theory of water injection has existed for about 50 years and revolves around controling the burn of fuel in the piston. A fine mist of water is sprayed into the fuel and air mixture. firstly it cools the air coming into the air system, increasing the oxygen density which helps to keep bost levels high. 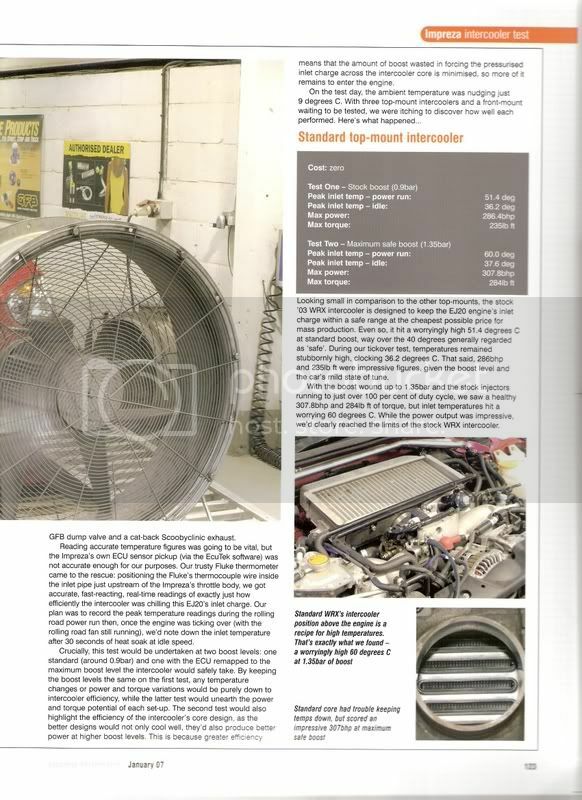 secondly it creates a dampening affect on the fuel and air mixture burning, which sounds like a bad point, however, the wate content isn't high enough to prevent the full mixture burning, but it is enough to prevent uneaven burn and varying detination which can cause major engine damage. Last edited by skylight; 07 Nov 2006 at 09:55 AM. As above, for and early impreza definately a front mount. You can get a Hybrid GT FMIC for £300 these days brand new. but a remap of your ecu will be needed as said above. I understand that the fmic is a big job and can take some time. Having spoken to a few people on the early classics some of the fmic's dont fit properly either. I have easy access to the v 3/4 sti tmic will this improve my setup at all? To fit a front mount you haev to cut some of the inner wing, remove some of the bumper and fit an induction kit, then map it. however it will reduce heat issues and also if you sit in traffic for a while and give it welly straight away with a top mount it can be heat soaked and wipe out your engine. Front mounts are by far the best way to go on all models once you hit 300bhp. 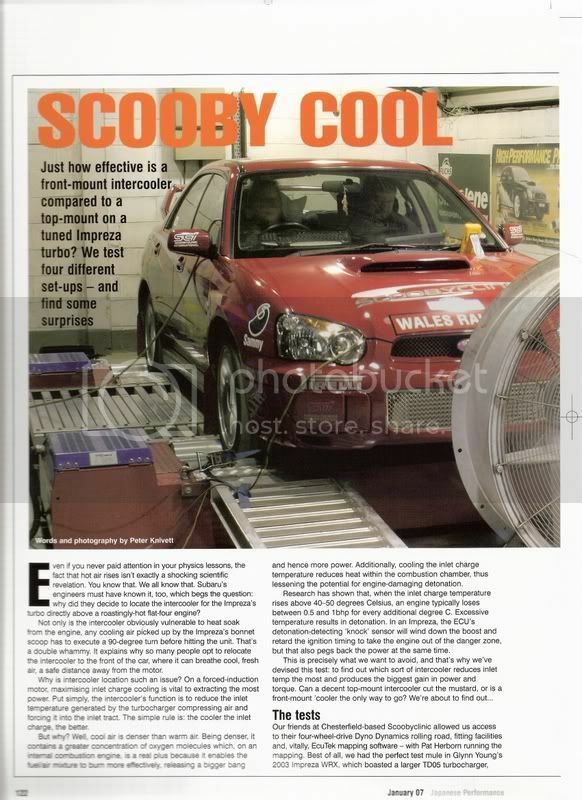 What about a bigger scoop to improve air flow on to a tmi and replace it with a STI V4 intercooler. Also is a ZERO SPORT INTERCOOLER AIR INTAKE unit which fits inside the scoop worth the money. Also what about replacing the little vents with a scoop too increase the air flow into the engine bay to cool it. helps a bit when moving, but not when sat in traffic, heat rises stright into the intercooler. the shape of the front actualy baloons the air up and over alot of the scoop, raising the scoop does help a bit, but your still talking a very small area of air going through to it. simply put, above the engine is a crap place to put anything trying to take heat away from anything to do with the engine. Ok so on top is not a good place. I'm only slightly moding mine at the moment. Exhaust, green, filter, forge rec dump valve. I will get a bigger scoop and the vent thing. 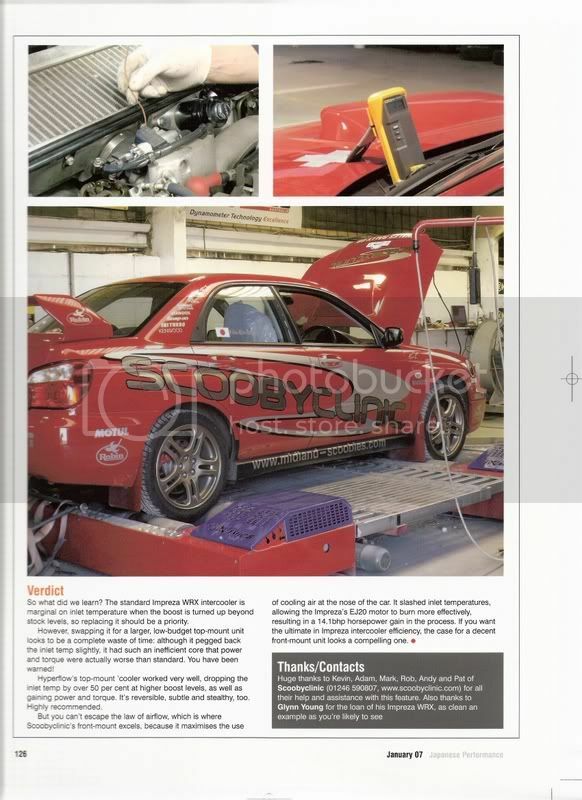 Whats next is it the ecu as mine is a uk model what issues do I have with the ecu I have herd you can not remap it. As with the mods, it will need a remap. 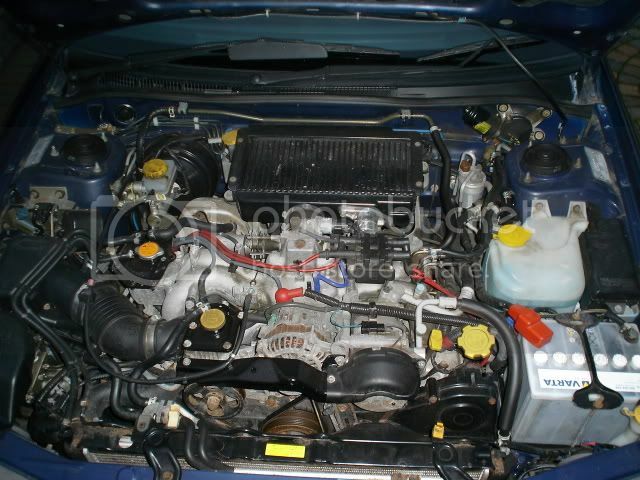 As the car is a 98 2000 turbo can i use a ecu out of another model. Best price and where get it from any ideas would be great. At what point do you get to the 300bhp mark with the mods normaly before I have to go fmi. Last edited by GTSTr32; 23 Feb 2010 at 02:20 PM.